When do you meet: St Albans Red Tent meets on the Saturday nearest to the New Moon and usually runs from about 1:30-6pm with a shared meal at the end. 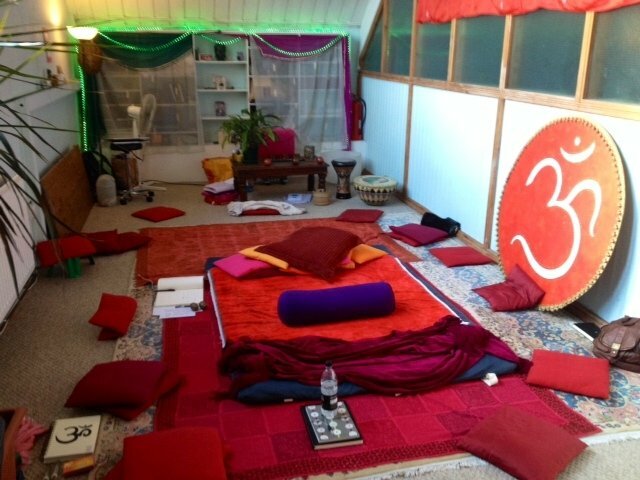 Once the women have all arrived, had tea and greeted each other, we move upstairs into the Red Tent space. Usually we use a ritual, such as smudging, to help us all arrive in this sacred space. After we have had a moment to gather ourselves, we begin with a checking in circle, so all women have a chance to speak and to introduce themselves and how they are feeling. Thereafter the women are asked to share what they feel they need from the Red Tent for that day and to present anything that may have brought as an offering to the day, for example a song, poem, a story. Although we usually have two women who have offered to facilitate the circle, this is merely to guide and allow things to evolve from the group itself. Sometimes we might have a topic for the afternoon from which discussions and sharing arise. Sometimes a woman may offer to lead a craft activity, but mostly we simply allow the day to unfold spontaneously. Once the afternoon has run its course we end with a closing circle and a shared potluck dinner. All women of menstruating age and beyond, are welcome, as are babes in arms. Do you ask participants to bring anything, wear red or make a donation? : We invite women to wear something red if they wish, and to bring anything they would like to share with the group, for example materials for a craft activity. We ask for a donation of £2 each, to cover the hire of the space at The Yoga Hall.